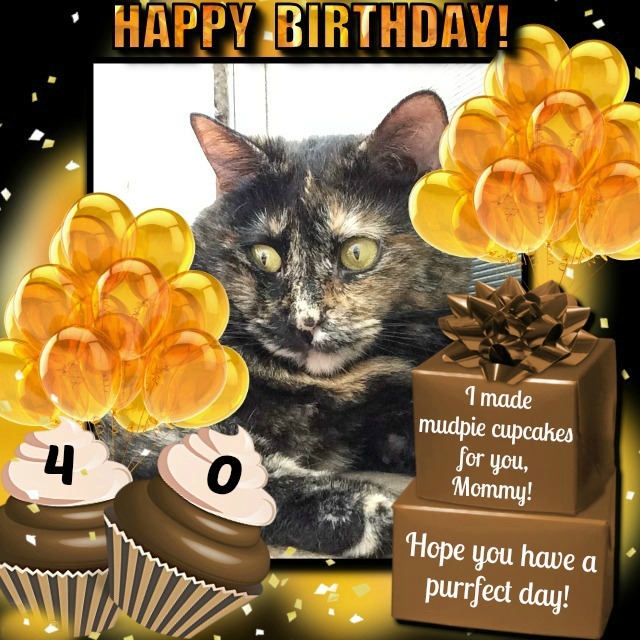 Melissa's Mochas, Mysteries and Meows: Holy Tortie, Mommy's Forty!!! It's a big day at our house as Mommy hits the "big 4-0". I'm 4, so does adding a 0 to that number mean she's headed for the bone orchard? It must, because the way she's been carrying on you would think it's the end of the world! Happy birthday to your human, Mudpie! Happy Birthday to your mum Mudpie! Hope you both celebrate lots! Happy Birthday, Melissa! What a beautiful card from your special girl! Hey you ungrateful cats, what about me? Happy birthday, Melissa! Hope it's purr-fect. Happy happy happy birthday to Mom Melissa! Mudpie, tell your mom that age is just a number, and she can show it who's boss! Have a fun and festive birthday, Melissa! HAPPY Birthday and lots of purrs!!! Happy, happy birthday to your mom! She's a spring chicken. Happy Purrs Day! Our human is ancient--she's been around since the beginning of the cat legends--so tell your mommy to get a grip. She's got to keep it together for another 20 years at least for you! Happy Birthday MP's mom! Yep, things go downhill fast after 40. Happy Day, Mudpie's Mom! Happy weekend too! Oh purr, purr, purr...The Big 4-0 has always been a joke. Real changes may start around The Big 5-0, but 40's not even midlife. Mudpie, I hadn't noticed your human being so young, because she writes like a grown-up human...I'd thought she'd be about 50 like me or 60-70 like most people I know--but she is SO YOUNG. Give a big birthday hug to your mom! Happy birthday to your mummy, Mudpie! Tell her the 40s is the best decade where wonderful things happen. Wishing her many wonderful years with you! Happy birthday, Melissa. Mudpie, my boys Hamilton and Jefferson think you are a beautiful Tortie. Purrs. Happy Birthday to your mom, Mudpie! We hope she has a great day. And if it helps her feel better, she's still way younger than our mom. Happy Birthday to your wonderful Mom! She looks much younger than 40 in the photos I have seen of her. Happy Birthday to your very special Mom, Mudpie! I'm sure that you are her best gift! Happy birthday to your mommy, Mudpie! I know that you're her best gift. If it's any consolation to her, she's young! Happy Birthday!!! This should make you feel better - next year I will be the big 6-0! !